Onigiri, Japanese rice balls, make a great snack. And now, amazingly, rice balls can be a drink too. 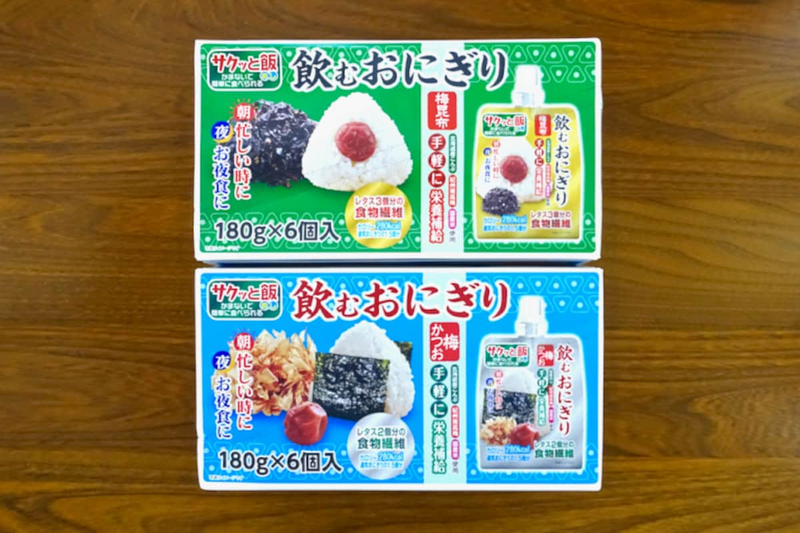 Japanese food products company Yokoo Daily Foods has just released its "Drinkable Rice Ball" (Nomu Onigiri) line. Each 180 gram (6.3-ounce) pouch is roughly equivalent to one rice ball, and there are two flavors from which to choose. The pouch has a nozzle at the top, so you can squirt the drinkable rice ball right into your mouth. Before anything else, though, we wanted to see what exactly we were going to be putting into our bodies. After all, onigiri are usually treated like food, not beverages. Initially, we imagined the pouch’s contents might be essentially okayu, Japanese rice porridge, but it turns out that’s not the case. …and the second being ume kombu (plum with kelp)! As we took our first sip, we were surprised to find that the consistency isn’t watery at all. The grains of rice retain just the right amount of firmness, and you’ll probably want to chew them a little bit before swallowing. The bits of plum pulp also add to the satiating texture. The drinkable rice balls are no slouches in the flavor department either. Both have a subtle sweetness from the rice, which continues all the way through with the bonito flake version, whereas the kombu one transitions to a refreshingly crisp, slightly tart finish. If you’re interested in trying this unique hybrid of food and drink, they can be ordered online from Yokoo Daily Foods for ¥960 yen (about US$8.65) for a six pack (ume katsuo here, ume kombu here), or in Japanese supermarkets individually for ¥160 yen each. Read the original story (complete with GIFs that show the product in action!) from SoraNews24 via the link below!